Quality flat lead encased in our best carpenter pencils. 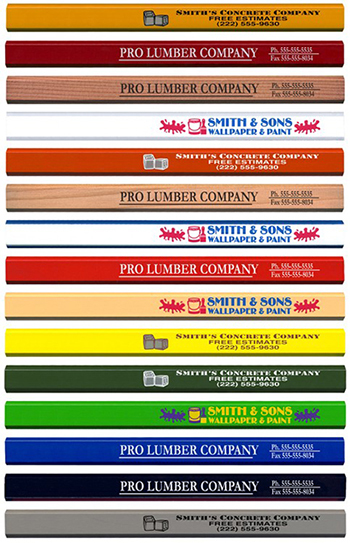 Solid contrasting barrel colors continue the popularity of the true carpenter pencil. This one is flat-out a Best Seller! Flat: 1 color of ink imprint, one side. Second Side Imprinting: Because the carpenter pencil is flat, 2nd side imprint is available at $35.00 per M or less. Lead Degree: medium only. Carpenter’s flat lead vs. one standard round pencil. If you have a question on art, Click Here for info. Imprint area for this pencil: 11/32" x 5-1/2"
SAME IMAGE ON SECOND SIDE.